In winter, I was dreaming of summer outfits, easy and fast sewing projects, and I was imagining a lot of dresses in light and colorful fabrics. When summer came, I found myself sewing suits. Cotton or linen certainly, but with collar, sleeves and pockets, and all the work that goes with that. 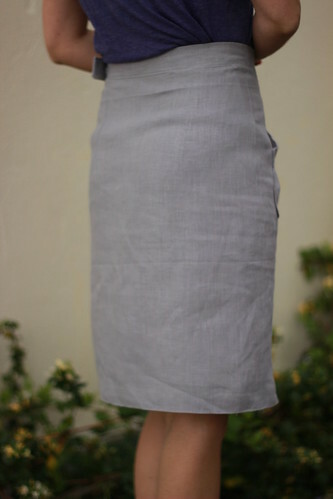 Here are the two-piece in gray linen that I often wear mismatched. The jacket is relatively strict, except the rounded front edges. 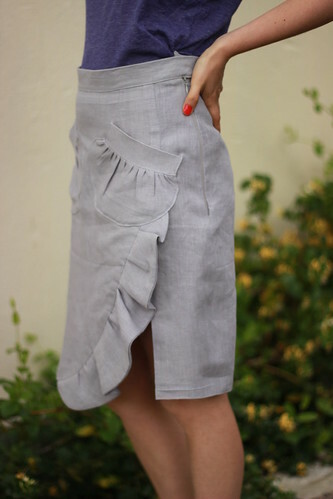 The skirt, meanwhile, deserved more fancy. 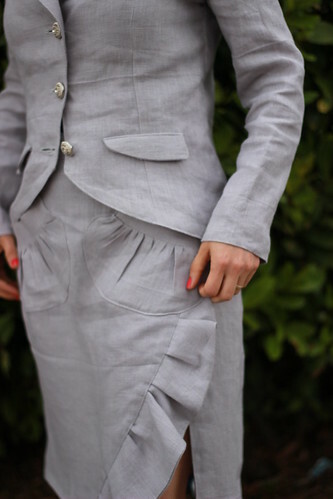 I have therefore added ruffles and pleat pockets. And to complete the outfit, I found this graffiti that matched with my shoes and the excavator that matched with my nail. Better than the beach, the docks. I take this opportunity to wish you fun and relaxing holidays, away from the sewing machine and from Internet. Be ready to fill your sewing calendar with awsome ideas when back. For those who stay connected in August, it is quite possible that you will find holidays photos on my Instagram or swimwear pins on my Pinterest, or absolute truths on my Twitter. The holidays are also an opportunity to change our habits. I’ll be back in September with fresh news. 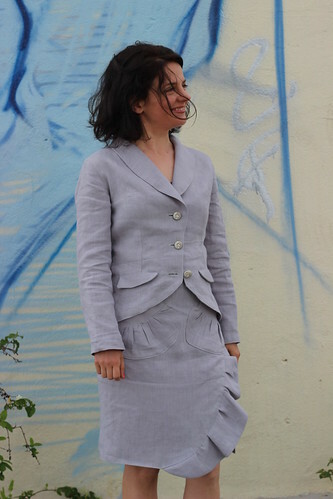 This entry was posted in Projects and tagged linen, suit. GORGEOUS! I would save up to buy that in a second, and I haven’t been excited by a suit in decades. You’ve turned me into a suit lover! Want the jacket! I’m going to a Sit & Sew with Kenneth King & Susan Khalje soon. 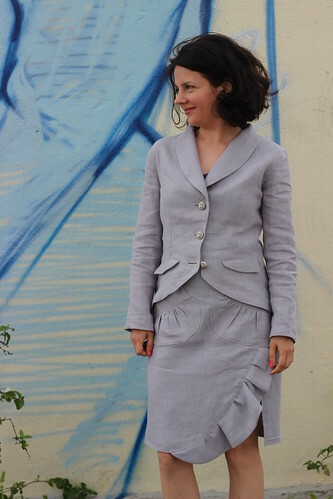 Want to focus on tailoring , and that jacket suits my figure and sensibilities perfectly.